Metal Racking Bays 5Tier Freestand Garage Shelving Heavy Duty Storage Rack Units. This great 3 bay shelving deal, is ideal for the office, home, garage, or store room, if you are looking for a professional product for a keen price this is the range for you. With super smooth solid 7mm MDF shelves which will hold a load capacity of 275kg UDL and with 5 levels they are ideal for all storage needs. 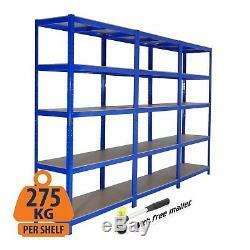 An Amazing 275kg UDL per shelf. Each shelf is a Smooth 7mm MDF sheet which is stronger than chipboard. Made from 1.2mm thick Steel. Powder coated in a Blue Gloss for long lasting finish. Central support on each shelf for added Strength. Adjustable shelf height every 35mm. Tested & certified to EU & International Manufacture & safety standards. Boltless easy to assembly, tap together with a rubber mallet. 3 individual units of 1800mm H x 900mm W x 600mm D are used to make this configuration. Shelf surface 895mm W x 595mm D. Assembled dimensions 1800mm H x 900mm W x 600mm D. Box dimensions 920mm L x 610mm W x 70mm D (3 Boxes supplied in this deal). UDL - Uniformly Distributed Load. Any product you return must be in the same condition you received it and in the original packaging. The item "Metal Racking Bays Freestanding/Garage Shelving/Heavy Duty Storage Racking" is in sale since Sunday, September 17, 2017. 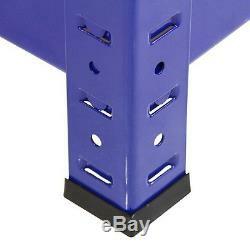 This item is in the category "Home, Furniture & DIY\Storage Solutions\Storage Units". 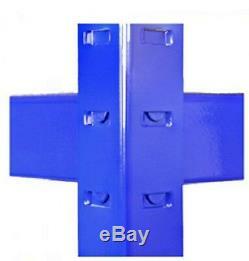 The seller is "shelf_racksolutions" and is located in Castleford. This item can be shipped to United Kingdom.